Depending on where you live, May 1st may have some connection, historically or actually, to labour and workers’ rights, or even socialism and class struggle. 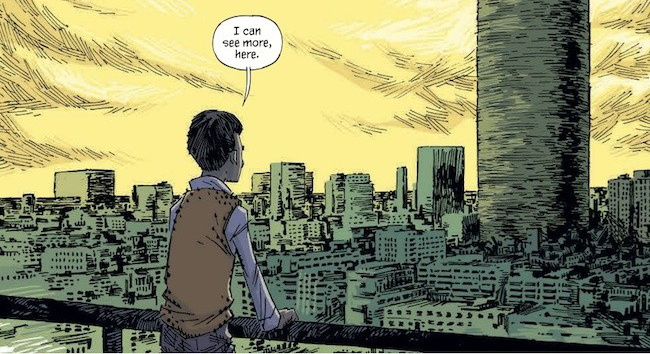 On this occasion I thought I’d write a little blogpost about politics and comics. 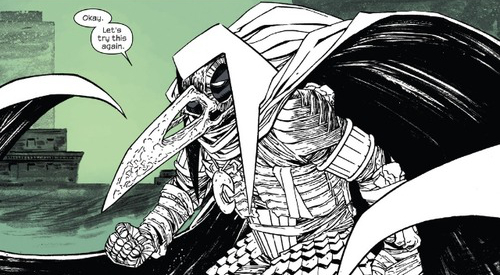 Some years ago at a conference, I attended a talk on a certain political or ideological stance in the comics of Warren Ellis,¹ which made me wonder what stance, if any, can be found in one of his latest comics, his short-lived Moon Knight run from 2014. Each of the 6 issues is beautifully illustrated by Declan Shalvey and Jordie Bellaire, and tells a largely self-contained story. I have already reviewed issues #1-3 on this weblog, so today we’re going to look at the second half of the run, which consists of the stories “Sleep”, “Scarlet”, and “Spectre”. Politics is sometimes defined as “beliefs and attitudes about how government should work” (Macmillan), and that is the definition with which we’ll work here. At first glance, there seems to be nothing political about these typical masked vigilante stories: Moon Knight comes to the scene of the crime, confronts and eventually defeats the criminal(s). (At least in “Sleep” and “Scarlet”, whereas “Spectre” is told from the antagonist’s point of view, but the result is the same.) On closer inspection, though, society and government appear in all three of the stories. Government is always present in the struggle between police (i.e. enforcement of the law made by the government) and crime (i.e. defiance of the government and its law). The New York Police Department is portrayed in an unfavourable light: unable to solve the crimes themselves, they rely on Moon Knight, who works outside of the law. Unlike in other superhero stories where police officers try to solve the crime themselves, overextend themselves, get into trouble and need to be rescued by the superheroes, the NYPD in Moon Knight doesn’t even try. Moon Knight does their work for them, and he does it in a way police couldn’t (or shouldn’t), killing, maiming and unnecessarily hurting his opponents instead of arresting them. The criminals, on the other hand, – including Ryan Trent in “Sleeper” who starts out as one of the ‘good guys’ but ends up killing innocents – are basically given free rein in this New York City. In all of the three stories, their crimes are ultimately avenged by Moon Knight, but only after they were able to placidly commit them. 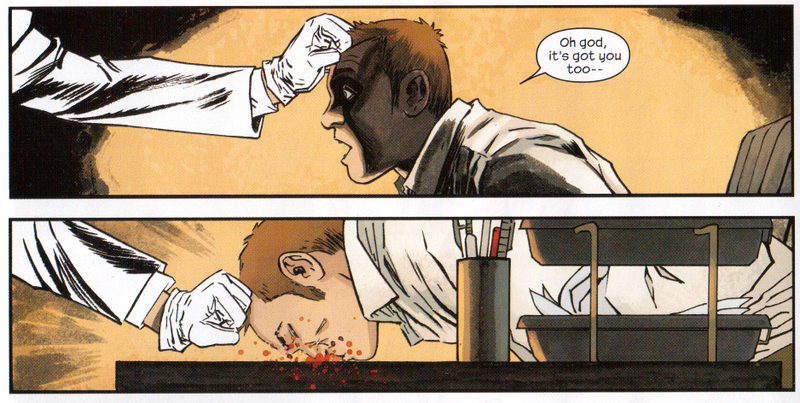 Moon Knight is not one for preventing crime. Warren Ellis has created a world in which government has failed. To maintain order, it takes a force – Moon Knight – that has the necessary financial and physical power, without being controlled by the government. 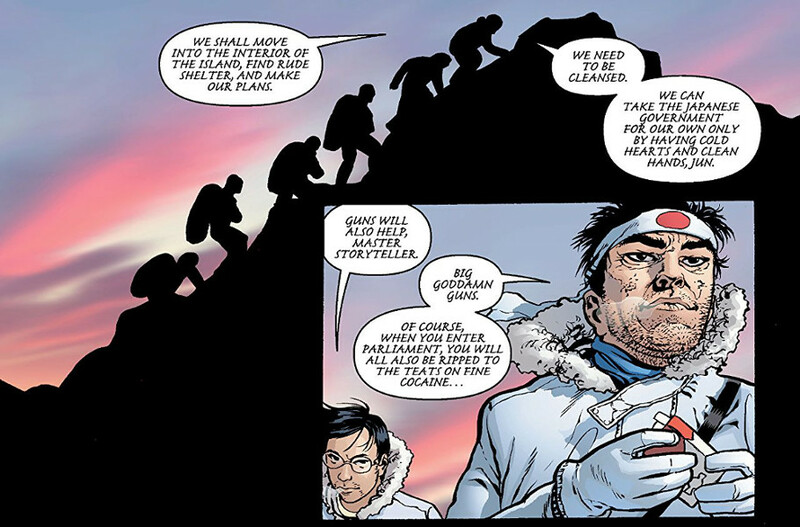 This is a political vision that has little to do with democracy, in the sense that the people had any control over Moon Knight’s ‘work’. But it has a lot to do with ‘might makes right’ and the ‘longing for the strong man’ – ideas more closely associated with dictatorship. Granted, many superhero comics operate within a similar mindset, but in Moon Knight these ideas are particularly noticeable. ¹ This blogpost has very little to do with that conference paper and I don’t mean to evaluate (or even paraphrase) its hypothesis; as far as I know it hasn’t been published anyway. 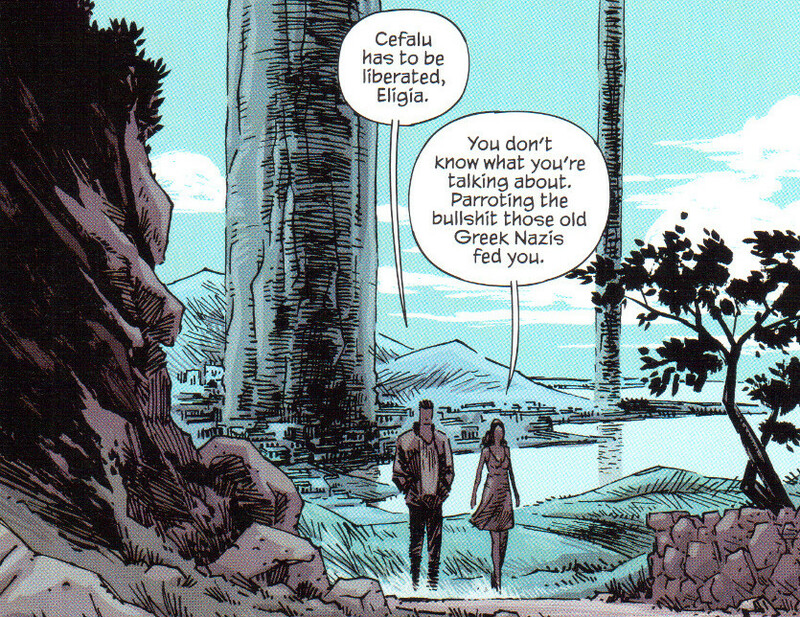 But just for the record, I’m referring to “The Paranoid Style in Warren Ellis’s Comic Book Politics” by Christian Knöppler, presented at the 2012 ComFor conference in Freiburg, Germany.